A tarp & bivy offers full — albeit barebones — protection against precip, insects, groundwater, and wind. It’s an ultralight and compact package that will be too minimalist for most. In a normal winter, the Sierra Nevada, Pacific Northwest, and Rocky Mountains get hammered by systems that roll off the Pacific Ocean and drop hundreds of inches of snow. The summers, however, are sunny and dry, with only occasional precipitation related to the North American monsoon. Storms can be violent, but they are normally short-lived and an afternoon-only concern. Bug pressure, meanwhile, requires action for about six weeks, plus/minus depending on the location, winter snowpack, and timing of the spring melt. Even when the mosquitoes are thick during the day, they are grounded at night by a light wind or temperatures below about 50 degrees. The Desert Southwest sees even less precipitation and fewer bugs. In such benign conditions, a backpacking shelter is rarely even needed. While I could continue to carry my modular double-wall tent as a just-in-case precaution, I instead opt for a lighter and more compact tarp and bivy system. This combination offers sufficient — albeit barebones — protections. My tarp & bivy system is the lightest and least expensive of my go-to backpacking shelter systems. The reason is simple: There is not much to it. Retain protection against insects and groundwater, and some wind. Camp where I would struggle to pitch a tent, like on a slickrock slab or under the tiny canopy of a krumholtz spruce. Can move around more comfortably, because I’m not stuck inside a bug nest or fly. Cowboy camping in southern Utah, where the nights are almost always dry and bug-free. For such benign conditions, why carry much of a shelter? Another oft-cited advantage of tarps is ventilation, which helps to reduce condensation. This is absolutely true, but it’s not a relevant perk in the arid Mountain West and Desert Southwest, where nighttime temperatures usually remain above the dew point. Furthermore, while the bivy is fully enclosed, there is no fully enclosed living area, as there is with a tent. For better or worse, with a tarp & bivy you feel more immersed in the wilderness. Cinch tightly the hood of your mummy bag, and let the mesh drape across it. But even if the bugs can’t get at you, their high-pitched whine will keep you awake if they are inches from your ear drums. I only use the tarp & bivy if I expect no or light bug pressure. I can handle a persistent mosquito or two, but I prefer other solutions for constant pressure. Open-sided tarps are incompatible with wind. The photos that suggest otherwise are good candiates for Instagram.com/YouDidNotSleepThere. If they went through with it, I hope that the photo was worth a crappy night of sleep. Some types of tarps can provide full-sided wind protection. But unless this need is the exception (not the norm), I would rather have a full-sided tent that is easier to pitch and that has a real door. In high winds, an A-frame tarp can be like a wind tunnel. On a desperate night in the Grand Canyon, I took (not very effective) refuge behind this dead tree. Some tarps and tarp pitches can offer more wind protection than an A-frame, but if I’m regularly coping with high winds I would just assume have a full-sided tent that it easier to pitch and that has a real door. I have used a tarp & bivy in every ecosystem in North America. Without question, it excels most in the Mountain West and Desert Southwest, where nights are normally dry, calm, and bug-free. In other settings I’m not as enthusiastic about it. Nighttime temperatures do not drop drastically in the East, and mosquitoes buzz around all night during the summer. 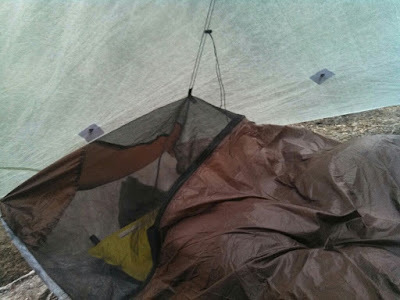 So at a minimum, I would swap the bivy for a tent-like nest such as the MSR Thru-Hiker Mesh House 2 or one from BearPaw Wilderness Designs, for more robust bug protection. This system would approach the weight of a lightweight tent, but it would be better ventilated and more versatile than most (because not all tents are modular). For example, the nest could be pitched inside of an AT shelter, or pitched by itself on dry nights. A tarp & bivy before a wet night in Shenandoah National Park. For the eastern woodlands I think the system makes less sense. The night-long whine of mosquitoes just inches from my ear drums is overly bothersome. In the Pacific Northwest, I would be concerned about nighttime insect pressure at lower elevations (warm temperatures), as well as driving rain at higher elevations. The latter can be partially mitigated by an oversized tarp, such as the Rab Siltarp3, which is a giant 10’ x 12’, but I would tend to simply favor a full-sided modular tent. I would be curious to hear thoughts from PNW specialists about the tarp & bivy system. Even if you end up with a different type of backpacking shelter (e.g. a tent or a hammock), do not give up on tarps in wet environments. They can be used to create a large protected space under which a group can gather in wet weather, rather than everyone being stuck in their individual shelters. A budget friendly option is the REI Camp Tarp, which is a 12-foot square and about $70. Oversized hammock tarps work extremely well, too. On wet trips a group tarp pays enormous dividends. It provides a communal spot to gather that is out of the rain and well ventilated. Without one, group members are more likely to remain isolated in their individual shelters. Unless you just want to impress other people in the forum with your UL gear list, avoid handkerchief-sized tarps like the Rab Element 1, which is just over 7 feet long and 3 feet wide. When you actually need it, a small tarp will fail you: it offers minimal interior space, and the scantily protected head and foot will get wet from rain splatter and incoming rain. A few extra ounces of fabric go a long way in increasing the space protected by a tarp. For example, the MLD Grace Duo weighs just 2.8 oz more than the Solo, but it’s 6 inches longer and 24-30 inches wider, enough space for a second person or to create a palace for one. Dedicated A-frame tarps have a pre-shaped catenary curved ridgeline that eliminates sag but hinders flexibility. I like them: they are simple and relatively easy to pitch. The two open ends are vulnerable to driving rain, but that can be offset with good campsite selection, an oversized tarp, and a low-to-the-ground pitch on the windward side. Some A-frame tarps are tapered, whereby the head area is wider & taller than the foot area. Others like the Eagles Nest ProFly Sil Nylon Rain Tarp have a uniform width. Tarps with a taper make for better ground shelters, but symmetrical tarps can play double-duty in a hammock system. Flat tarps like the Sea to Summit Escapist, which is 10’ x 10’. They are the most versatile, but also the least user-friendly because they have no natural shape. A-frame tarps with optional “beaks” at the head and foot, like the Rab Element 2. These beaks improve storm-resistance but add weight, reduce ventilation, and limit pitch angles. Poncho-tarps like the ZPacks Groundsheet-Poncho, which is best used as just-in-case shelter or rain gear, not regular use. An A-frame tarp (right) and flat tarp (left) on the Kings Canyon High Basin Route. The flat tarp has a more adaptable pitch than than the A-frame, and was configured to provide more wind protection. But if I were camping regularly in such exposed settings, I would simply opt for a full-sided tent. A bivy with an all-mesh top like the Borah Bug Bivy or Outdoor Research Bug Bivy will be cooler than a fabric top like the Mountain Laurel Designs Superlight or ZPacks Splash. That is an advantage in warmer temperatures, but a disadvantage in cooler and windier conditions. Fabric tops must be made of highly breathable fabric. Avoid “coated” top fabrics, such as with the MSR E-Bivy, as well as any “waterproof-breathable” top fabrics, such as with the Black Diamond Twilight Bivy. Without adequate breathability, moisture (from insensible perspiration and drying clothing) will become trapped inside the system and condense when it reaches the bivy top, wetting your sleeping bag. Unless you want to squirm into your bivy each night, select at least a standard length zipper. It adds about a half-ounce versus a short one, big whoop dee doo. The primary purpose of my bivy is to keep the insects off me. The floor should be waterproof, but it need not be bomber since I always sleep on top of a waterproof ground sheet and since the ground is usually dry. The water-resistance of the top fabric is not a concern of mine. I rely on an oversized tarp to keep away precip and splatter. Plus, I have no long-term faith in DWR treatments. In addition to bug nests, mentioned earlier, another alternative to the bivy is to simply do without it. I would only recommend this if you are using a mummy bag, which is less drafty than a quilt, and if you are expecting no bug pressure, since your backup system would be a head net. Flyin’ Brian’s tarp & groundsheet. Since he uses a mummy bag, he does not need a bivy. If bugs are a remote possibility, he may bring a headnet for just-in-case insurance. A ground sheet is optional in the tarp & bivy system, although I would generally recommend it, and strongly recommend it to bivy-less sleepers. Reduce abrasion between the air mattresses and the ground, and to blunt sharp objects like pine needles. Cowboy camping in the sub-alpine in the Wind River Range. The Mylar space blanket provides a clean space to lay out my gear, protects my air pad from abrasion and sharp objects, and adds some warmth. A popular groundsheet is Gossamer Gear Polycryo, because it’s cheap and ultralight. You can buy this material locally at hardware stores, in the form of window shrink map, but you must cut it to size. My ground sheet preference is an emergency space blanket. It is comparable in expense, weight, and durability as Polycryo, but it is warmer because the Mylar reflects radiant heat. Own a tarp & bivy? What’s your exact setup and what are your thoughts? Considering a tarp & bivy? What are your top prospects or your reservations? My go to set up is a Gossemer Gear Spinn Twinn tarp (no long manufactured with spinnaker materiel). My geo-specific shelters (Northeast – West, Pacific NW) I use are the Henry Spires Tarp Tent (Squall II – no longer manufactured) and the Sierra Designs Tensegrity 2 Elite Tent (at 2.5 lbs it’s super light). Both offer full protection and I feel are perfect for all three seasons. When I might be challenged for a smaller foot print area, I opt for the Squall II over the Tensegrity but you can’t beat the versatility, space and comfort of the Tensegrity. With my Tarp, I use a Tyvek ground sheet (washed about 4-6 times – makes it less noisy and more flexible) – then goes my air maters and Enlightened Eq. quilt (20 degree). I used to use a bivy (MLD superlight) but learned I really did not need it and since I move around plenty in my sleep it just became an irritant. Even in heavy rain and light snow conditions – I never have looked back or regretted not bringing a bivy. The only caveat is if I don’t pack a bivy, I definitely bring a ground sheet. Hilarious. We are told in the equipment list that trekking poles are unnecessary and natural anchors are best. But picture after picture shows the trekking poles in use. So add $150 to your already high dollar equipment list. Natural anchors are best, but not always where you need them to be. If they are an option, I use them every time, and encourage others to do the same. My trekking poles are going with me regardless of whether I use them as part of my shelter or not. I count their weight and cost elsewhere in my master gear list. Here’s a nice $30 set for you, Cascade Mountain Tech Quick Lock Trekking Poles. I use the Borah gear bivy (not side zip) and a Borah 5×9 tarp, with extra pulls for versatility. My pad is a blue foam Walmart pad, cut to about 3/4 size. I supplement that with a leaf pile that I’ll put my ground sheet (visqueen) over. I usually pitch an A-frame, with the windward end close to the ground. I love it, and it’s my go-to for the Appalachians. I like the bivy for bug and wind protection, but . . . the bottom is so slick I usually slide in one direction or the other. As a side-sleeper, this can be frustrating. What are your thoughts on how to correct the sliding? I’ve put a total of 8 quarter size dabs of silicone on the top of the bottom layer (read where the bottom of your pad touches the top of bottom layer) to correct that problem. So far so good with a neoair and about 10+ nights as a side sleeper. Have you tried placing your sleep pad inside the bivy? I started doing this over a decade ago and have slept out hundreds if not thousands of nights like this and it works quite well to prevent slipping and sliding all over the place. Have you ever used, or have thoughts on, a “bug net condom” system like Lint uses? Seems like it’d be good in situations with little chance of rain whilst dealing with bug pressure better than a bivy. I’m in the process of sewing one together (estimated 3.5oz), long enough to cover up to my thighs in a quilt, whilst giving more headroom than a bivy. Plus, i can sit up it in cross legged and stay covered when sat still in buggy areas. Send along some photos and share your feedback after you have taken yours out. Tarp sans bivvy is our (wife’s and mine) go-to system. We rarely use it because most of our backpacking is in the desert in winter. No precipitation and no bugs. In fact, during our last dozen or so nights, we’ve set it up exactly once based on the appearance of the evening sky. Ended up not using it. Just a polycryo ground cloth, NeoAir Xlite, and quilt and we’re good to go, with an unobstructed view of the Milky Way. Still, the tarp is a nice “just in case” item for an extra ~23 oz. (MLD Grace Duo, silnylon, including guy lines and stakes). We also have a Six Moon Designs Lunar Duo for the far-less-frequent summer trip to the mountains, where/when bugs can be an issue. More weight (~42 oz. ), but the tradeoff is usually carrying far less water than when in the desert. Also use the REI Half Dome 2 for car camping/base camping and canoe camping where weight and space are not as big of concerns. Free-standing, sturdy, easy and quick set-up. And a whopping 6.5 lbs. It is rational to be fearful of scorpions and snakes that might want to snuggle up with you? I don’t think so; certainly not in the case of snakes. Most squamates go into brumation (dormancy) during the winter and aren’t likely to be slithering around in nighttime temperatures of 40 or below. I think most “dangerous” desert creepy-crawlies … tarantulas, scorpions, centipedes … are much the same – torpor, I think it’s called. At any rate, in all the nights I’ve slept on the ground, I’ve never had any visitors in my quilt. At least that I know of. Fearful? No. Cautious? Yes. The biggest thing to watch for is to make sure you check your footwear and gloves thoroughly before putting them on. I don’t backpack much through the desert, but 12 years as a Marine infantryman led to many, nigh countless nights sleeping on the desert floor. You question was about creepy crawlers on cool desert nights, correct? In which situations should we be concerned about spiders and snakes getting under our quilts? I frequent the wilderness in Georgia, Tennessee, & North Carolina, and I always imagine a snake passing by on cool ground, and noticing that my quilt is a few valuable degrees warmer, so she’s at least gonna investigate. So I’m always enclosed in something, even if it’s just a bug bivy. I’ve never used a shaped tarp. I’ve used 5×8 and 8×10 flat tarps. I actually prefer the smaller size. The 8×10 is too much fabric for one person (I’m short, which helps). I’m planning on trying a small square tarp this year b/c I want (even) more flexibility with pitches. A-frames have never really appealed to me. I like the semi-enclosed pitches like lean-tos. Definitely a psychological factor there but it’s pretty minor. I’ve only used a bug bivy (MLD), never a solid one. I like the MLD because you can tie up the head end and get the mesh off your face. I used (the nice) space blanket ground cloths for a while but I’m using polycryo now. It seems more puncture resistant, but more fragile once it’s torn. That’s been my experience with Polycryo, too. A little bit more resistant to punctures & tears, but tears quickly once it gets nicked. The Mylar puts it over the top for me, though. Especially when using an non-insulated sleeping pad, the difference is noticeable. I’m currently polycro, neoair all-season or S2S ComfortLight, and EE Revelation Quilt. Would the mylar make much difference, or does either pad negate its radiant properties? Just finished a section hike last week where a few more degrees of warmth would have really made a difference, and wondering if this would be that little bit to help me dial in my system. I have used 8’x10′ Silnylon tarp, 5’x8′ Silnylon poncho-tarp, 2-person cat-cut Spinnaker tarp, and 2-person cat-cut Cuben (current go-to option). I usually use a lightweight bivy (Pertex top and Spinnaker bottom) with a quilt or mummy bag when colder. I really prefer the openness to see what’s going on around me vs. a traditional tent. When it’s humid, I do experience condensation inside the bivy, so try to keep it open or elevated when possible. I like the larger tarps to provide better rain protection and more space, but prefer the Cuben cat-cut for ease of pitching. Larger Silnylon tarps (8×10) are harder to pitch tautly in wet, windy weather because of the sag of the material when wet and larger panels that flap in heavy winds. I have used my Chrome Dome umbrella to better seal off the foot end and my Cuben rain kilt to seal off the head when bad weather threatens and site selection is limited. Backpacking in New England I’ll use a tarp and bivy when overnight temperatures are 40 or below ensuring no bug problems. I have the REI Minimalist bivy and use a closed cell foam pad and sleeping bag inside the bivy. The tarp is a rectangular 6 x 9 ft if solo or a 10 x12 ft if with a partner, light weight sil-nylon from Campmor, typically pitched as an A frame using treking poles or a line between trees. For a ground sheet I just use the foot print from a tent. If the chance of rain is low I may not put up the tarp. My tarp + bivy is a very similar setup. Condensation is exceptionally tricky to minimize in a bivy out east; what are your strategies? Do you leave open the netting at the head? Although that should help a great deal, it leaves you open to bugs. FWIW, I had a lot less condensation with the tarp set up as A-frame than as a “flying wedge” (3 corners down, 1 tied to tree at head level). A breeze seems to help reduce condensation quite a bit, so the A-frame permits more airflow (esp. if you can pitch it high). In the southeast, where I live, nighttime humidity is very high, even in conditions of drought, such as we had in the 2nd half of 2016. This makes condensation management in a bivy all the more difficult. Some people modify their bivy and cut out a swath of fabric from the topside (down the middle, though I would think across the foot area would be better), and replace it with mesh. Seems like a clever solution for tarp+bivy camping, but if you are just dayhiking in the mountains and carrying a bivy for emergency shelter, you’d probably want an unmodified one for better rain protection. I wish I had read this article months ago. You would have saved me 100s of dollars… while I aspire to hike the AT and/or PCT I’m currently limited to the FT and so I’m limited to a hammock and cypress trees. The tarp I elected to take with me this weekend was a mylar emergency shelter that required rocks or some object to make knots as there were no grommets. I used the Yama Mountaingear Cirriform 1-person tarp for the Colorado Trail this summer. As Andrew says, the bugs are downed at about 8 PM and the lack of a screen was of no major concern. The tarp fitted nicely into small sites and that on occasion reduced the scouting that I had to do. I am tall and I would not want to have to spend two days in it in Inclement weather, I just can’t sit up in it when it is pitched close oto the ground The three nights it rained with wind/ poured without wind, the beaks really shone, everything stayed dry. Without the beaks this tarp would be too small in terms of width to store gear. I used 2 mil sheeting from the hardware store cut to shape as ground sheet. This was held in place with elastic shock cord via grommets in the sheet and looped around the stakes. Lasted about 10 days and was replaced from the bounce box with a new one. Mylar sheet sounds like an excellent alternative. Thanks Andrew, you are reading my mind again and writing articles on topic. When you say that you like the versatility of a separate tent, ground sheet and bugnet, do you mean that you leave some of it behind or do you bring all of it, but save time bt setting up a minimal camp based upon the conditions? My wife and I backpack both out West and in Minnesota. We have used a tarp and bivy, tarp and net tent, and tents. We now use a Duplex because of weight, great bathtub sides, but mostly because of mosquitos and ticks which are a hazzard in Minnesota. At 28.5 ozs it’s not much heavier than a tarp with a double bivy. I love this system. My current setup is a HMG 8’5″x8’5″ flat tarp with line locks removed and ZPacks Z-Line for the guy lines. I use two 6″ Y stakes and six-eight 6″ shepherd hooks. I don’t like using trekking poles for shorter trips so I salvaged some poles from older tents and made two custom length sections for when I can’t use my surroundings (3.2oz). I use a Tyvek ground cloth and a Borah side zip bivy when the conditions or insects get dicey. Condensation in any bivy here in the SE can be a pain, especially near the foot box of your sleeping bag/quilt. I had the folks over at Borah add a grosgrain tie out on the end to raise the fabric off of my quilt and it helps a bit. I spent a while deciding on my gear back when I was getting started a little while back. Things have CHANGED since my boy scout days to say the least! I’ve been blessed and was able to spend more or less ridiculous amounts of money for the lightest and strongest stuff I could find. I also wanted as much comfort as I could reasonably get. I’m on the south end of the AT so a full bugproof enclosure was a must for me personally. After reading about everything currently available I decided I also wanted to go with cuban fiber and that I wanted to try a quilt for my sleep kit instead of a bag. I move around alot so it sounded good. For my mat and bag I went with Nemo gear – an Astro insulated air lite (long size) and the tango solo down comforter. I keep a RAB silk liner along as well to help if I need to sleep a little warmer, or cooler (sometimes I’ll sleep just in the liner). And it helps keep trail grime off my the down comforter so I have to think about washing it less often. None of that set up is the absolute lightest thing around but it isn’t heavy by any measure is super comfy, fits my 6’2 frame well and has served me flawlessly so far on the SE AT and once down in NW Brazil for a week. The whole kit is also far from the cheapest but I bought gear that I believe will last me pretty much for the rest of my life with careful use and that I can use almost anywhere and certainly everywhere I’m ever likely to find myself going. Many folks won’t be able to justify spending $1000+ for a tent, bag and pad (and I don’t really disagree) but that sort of thing is one of the few advantages of getting older that I’ve found! As a final note: if you can, wait for blackfriday and similar sale periods. That Echo 2 is normally $695. I paid $540 by waiting for a sale to come up. Buy it as a kit with a backpack (if you need that also) and you can save even more). What are your thoughts on mummy bags with a Dryloft, Pertex, or similar shell? It seems like it would be a good alternative to a bivy when combined with a solid tarp. It would also save 10-36 oz depending on bivy. The bivies that I like to use in conjunction with a tarp are in the 6-8 oz range, depending on the size and exact materials. The heavier bivies (e.g. up to 36 oz) are mountaineering bivies that are inappropriate for backpacking, IMHO. The shell fabric of a sleeping bag needs to breathe well and keep the insulation inside. I completely disregard claims that a shell fabric is “water-resistant.” That simply means it is treated with DWR, which will degrade due to abrasion, body oils, and dirt. Waterproof-breathable shell fabrics do not breathe well. Thus, they trap moisture inside the sleeping bag and end up having the exact opposite effect than was intended — it causes the insulation to get wet, instead of keeping it dry. In a sleeping bag, at least, the moisture enemy is internal moisture, not external sources of it. To me it would seem that a bag with basically the same membrain as a bivy would breath a little better because it is not seam sealed. It would loose some of its waterproof characteristics but if used with a tarp could help avoid the dreaded wet footbox due to an unexpected shower. Unlike a bivy you couldn’t just take it off or leave it home. Just a thought. Anyway, I appreciate your work and enjoy reading your posts. Andrew, I’m curious as to how important you think the “bathtub” feature of a bivy or inner net/floor combo is? I’m looking at a tarp set up of some sort for lighter conditions when a full tent is unnessecary (I also like feeling “closer” to nature). I’d like to keep the setup to a tarp + groundsheet, I think – maybe having a net for when bugs are likely an issue. I live in new Zealand where it can rain a lot, even if unforecasted. So my concern would be the lack of bathtub meaning a higher chance of flooding my shelter – but maybe my concern is a result of needing to improve my campsite selection? In dry environments, the value of a bathtub floor is almost nill. In a wet environment, it’s only valuable if you can’t reliably find campsites where the precipitation will pool on the surface. For example, if you regularly backpack in a National Park with designated campsites, or along the Appalachian Trail with high-use campsites, the soil is no longer porous and the water will sit or run on the surface. In that case, a bathtub floor can help a lot. Of course, if I’m camping in that kind of place, I’m simply going to bring a hammock. That solves the issue entirely. Oh to be in America! I’m planning a 3 day trip in RMNP in early August and want to try a tarp (as opposed to my REI Quarter Dome2). Campsites are at 9000′ so I’m assuming temps will be low enough at night that bugs are not an issue. I’ve decided I want to go with a flat tarp to have some pitch versatility, but not sure what size to get. This trip is just me, but I want the flexibility of using it for 2 people. Considering 8×10, 9×9, and 10×10. I’ll be sleeping on the ground because I find hammocks uncomfortable. What should I consider when deciding between rectangular vs square? I’ve read some posts where people say square is more flexible, but I’m not sure why that would be. Is 9′ long enough for a max dimension? I have a high tolerance for discomfort, but if there is a significant flexibility or safety advantage to 10′ then I will take the 2 extra oz hit. For two people I think 9 feet is about as short as you want to go. 10×10 does not buy you much more, and it’s marginally more unwieldy. I don’t know why squares would be more versatile than rectangles. I think versatility is more a function of size than shape. If you have a rectangle that is, say, 6 feet wide, you’re going to be pretty limited by that. Awesome article, really helpful. I have done lots of tarp-and-bivi setups in the military, but never really on my own, and Im looking forward to experimenting with this ultralite form of camping this summer. As much as I love my tent for snow, bugs in Spring etc. I won’t have any excuses for a dry August in the Rockies! Ground sheet (Polycryo) – 1.2 oz. Borah Gear Cuben / Argon sidezip bivy – 5.4 oz. Pegs / stakes (8 Ti hooks, 2 MSR mini groundhogs) – 3.6 oz. The bivy has a mesh band around the head, and Argon 67 for the rest of the top part (all cuben bottom). I asked Borah Gear to use Argon instead of mesh for the upper ~6″ of the top, for a little extra splash protection. They did this custom work without an extra charge! The mesh section has a Grosgrain pull-loop sewn on; I taped a mitten hook to the underside of the tarp ceiling, and use a length of very thin elastic cord and a cord lock to keep the mesh raised off my face when I zip it up. Andrew, I was wondering if you had any thoughts on a good Grand Canyon setup. The past 3 years I’ve done multi-day hikes during spring, and had perfect bivy/cowboy camping weather until the last night — when I was hit with rain and some of the fiercest winds I’ve ever seen. One year it tore a hole and broke the pole in my TT Moment DW tent. Would you still go tarp/bivy and just hope for the best as far as site selection and tarp setup? Or would you be more inclined to bring a full tent? I would still go tarp/bivy. I know the GC gets some weather occasionally, but it’s rare and I think worth the risk. Bringing a very wind-resistant shelter seems like too much of a “just in case” for me. One thing about the wind. I have noticed in the desert (and the mountains, too, though not to the same degree) that the winds really calm down in the evening, after the sun goes down. I will often wait to set up my shelter until after the winds die down, because it’s such a nuisance to try setting up a shelter when the wind is blowing at a steady 10 or 15 mph, or more. Andrew, question for you. I’m glad to see you mention Bear Paw products. I’ve been eyeing their Minimalist 1 for a while now for use with a tarp. What are your thoughts on 30D vs. 70D silnylon for floor material in wet conditions? Someone on a forum said he got the 70D option since he’s experienced badly flooded sites (like the Rocky Mountain designated camp sites you mention in your site selection article). He felt 30D probably wouldn’t perform as well in such conditions. On such a small shelter the weight penalty is only a couple of ounces for 70D, but then again I like to be picky on “big 3” items. Thoughts? I would go with the 30d, and bring an extra ground sheet (e.g. polycryo, cut-open trash compactor bag, durable mylar blanket) for wet trips. Thanks. That was my original thinking; I’ve got polycro. I guess the issue would be sites that pond during heavy rains, submerging the ground sheet. If I was worried about submerging a ground sheet and desperately needed a bathtub floor, I would either (1) find a different campsite or (2) use a hammock. You mentioned RMNP. Not sure if you camp there. But my favorite sites are in the cross-country zones — I take them whenever they are available. You get to camp at-large, while everyone else worries about their bathtub floors. I’m primarily a hammock camper and am putting together a tarp shelter only for occasional use and getting some opinions before purchasing. I’m sure 30D will be fine for me. It would be rare or never that all of those factors happen at once: that I’m in a ground shelter+designated site+heavy rain+flooded site. Thanks a bunch for the input. Andy, Great to see you continue to reply to comments on these posts! So very helpful. I’m headed out on a 3/4 day section of the KCHBR in the first week of July. I’d like to go tarp/bivy, and cowboy camp most of the nights. Knowing that the bug pressure is usually high that time of year, will I be able to find spots to camp that are relative bug free? Your comment, “I only use the tarp & bivy if I expect no or light bug pressure.” has me considering a full enclosed shelter with some bug free space. I’m curious how you approach a tarp ridgeline with association with trekking poles. I’ve reviewed your stance on guy lines and using knots over linelocs. That guy line system makes nothing but sense to me. For corners and other tie outs the knotting system seems simple. But when you throw the trekking poles in at the ridgeline, you have to add something like a clove hitch to attach it to the pole. I’m presuming you still use a bowline to attach the guy line to the tarp, but it’s a trucker’s hitch still effective between the trekking pole and the stake? My guess is that it will still bring the tarp taught just the same, but I just wasn’t sure if the trekking pole messes anything up since the guy line wouldn’t be able to move around the pole. I’m guessing I’m just overthinking it. And info would be awesome! Use a bowline to attach the line to the tarp. And then the trucker’s hitch would then go between the pole and the stake? That loop set-up isn’t too loose? I’ll presume you just adjust the base of the trekking pole to achieve maximum tautness? Correct, put in a truckers hitch between the pole and stake. The loop around the trekking pole will not slide. I kept it loose in this photo so you could see it easily, but it tensions nicely and there’s plenty of friction in the system. I adjust the trekking pole so that it’s a few inches higher than the tarp’s apex. This gives it some vertical tension, in addition to the horizontal created by the guyline. Hi Andrew, I know you tried both the MLD superlight bivy and the Borah gear side zip bivy, I was wondering if you saw some differences between the two? Mainly between the top fabric, MLD mountain 10D and Argon 90 or 67 for Borah. At 95$ for the Borah side zip, it seems to be a great bargain. Thanks. I have not used the Borah bivy. The SuperLight is nice, but I agree with you about the Borah’s price. If you camp in a wet environment, the top fabric is actually not the key differentiator. It’s the floor fabric. With a high performance floor fabric, it’ll remain waterproof for longer (i.e. more nights). I think the water-resistance of the top fabric is a completely overblown marketing thing. You want it to be really breathable. The water-resistance lasts for about a week, after which time the DWR finish is to degraded to be of much value. Thanks for the quick reply. I’m looking for a bivy to use in dry climates, mainly to comboy camp. Living in the East, I use an innernet with my mid for wet and buggy conditions. Since it would be my first bivy, I was wondering how breathable they are. Did you have any condensation issues with the MLD superlight? Ticks are not my forte, but maybe someone else can chime in. I used to be a fan of tarp/bivy for Appalachians, because it’s light, works nicely with trailside shelters, and gives you full bug protection. But then I discovered hammocks, and I’m hard-pressed to use any other shelter type in that location. You have a link to a basic emergency blanket as a ground sheet. The Orange version in your pictures is the SOL version. Is that the 1 person or 2 person version you have shown? Do you have a reason for your size choice? Thanks for identifying it — I no longer have it, and didn’t recall where I got it. IIRC, it seemed more like a 1-person version than a 2-person. The ideal size gives you a few inches of extra length, relative to the length of your sleeping pad; and about 18 inches of extra width, relative to your pad. Also, consider starting off with less expensive cordage. You can experiment with various lengths, if necessary. Once you’ve got your setups dialed in, you can switch to something higher visibility, etc. and cut exactly what you need. Paul “Mags” Magnanti likes bank line; it’s light, strong and cheap. ( https://pmags.com/quick-tip-bank-line-for-cord ) I got some Catahoula bank line on Amazon that I’ll be using while experimenting with various flat tarp configurations. For some setups, it may be all I need. I also picked up some Atwood Micro Cord in neon yellow to experiment with for some permanent hi-viz guy lines on other setups; very light, comes in an array of colors and is far less expensive compared to some other cordage. It’s very thin but works fine with my tensioning system. I’ll just need to test long-term durability.